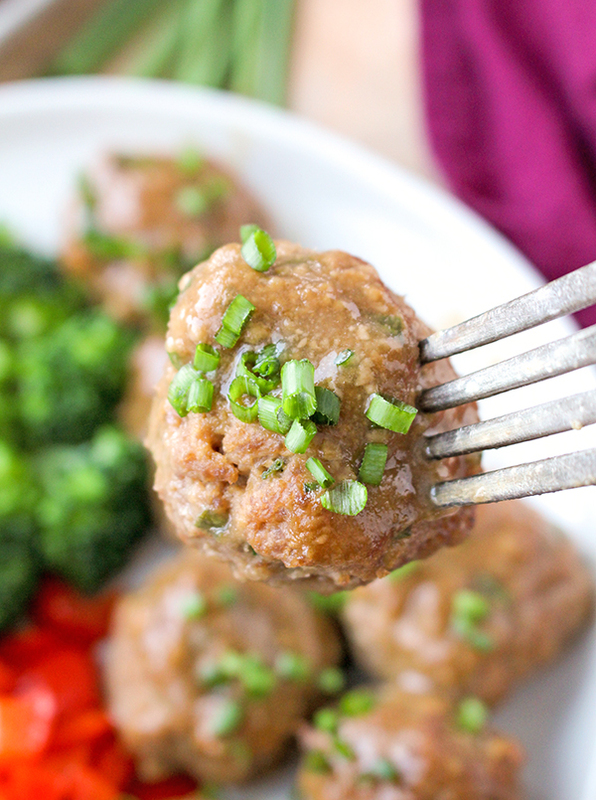 These Paleo Whole30 Turkey Teriyaki Meatballs are juicy, tender, and so delicious! Simple meatballs covered in an easy homemade sauce and baked to perfection. Gluten free, dairy free, low fodmap and sweetened only with a little fruit juice. Man oh man are these meatballs good! I have made 4 batches in the last week because they just don’t get old. They are my current favorite meal and I don’t see that changing any time soon. My husband and toddler love them just as much as I do so they are definitely family friendly. That may seem too good to be true, but it’s not. I use just a tiny bit orange juice and it adds sweetness and balances out all the savory flavors. I do want to mention I’m not a fan of recipes that say they are Whole30 and use 1 cup of orange juice because you know you’re going to get a sugar hit from that. Technically it’s okay, but I don’t feel like it’s the spirit of Whole30 and changing your habits. So only 2 tablespoons of juice for 16 meatballs- not bad! It comes together so quick on the stove-top then poured over the meatballs and baked. So the meatballs soak in the sauce and the sauce slightly caramelizes. So much goodness! These are super easy to make. The meat gets mixed in a bowl all together, rolled into balls, placed in a baking dish and baked with the sauce on them. 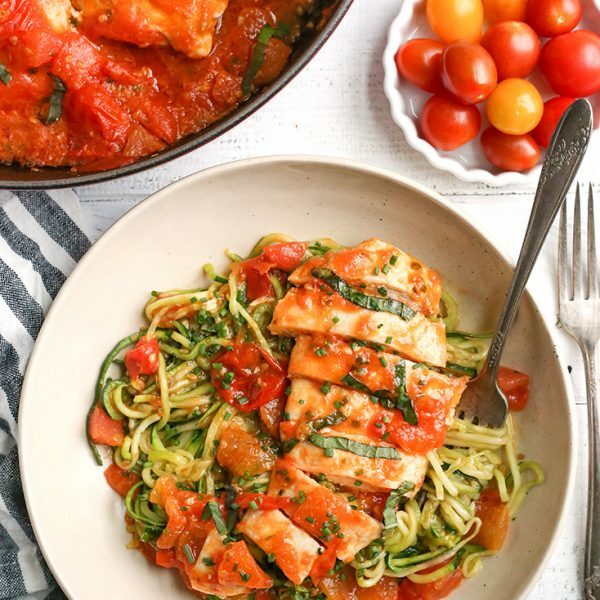 This is definitely a meal that could be made on a weeknight. Ready in about 30 minutes with all the rolling included. Not bad and totally worth it! 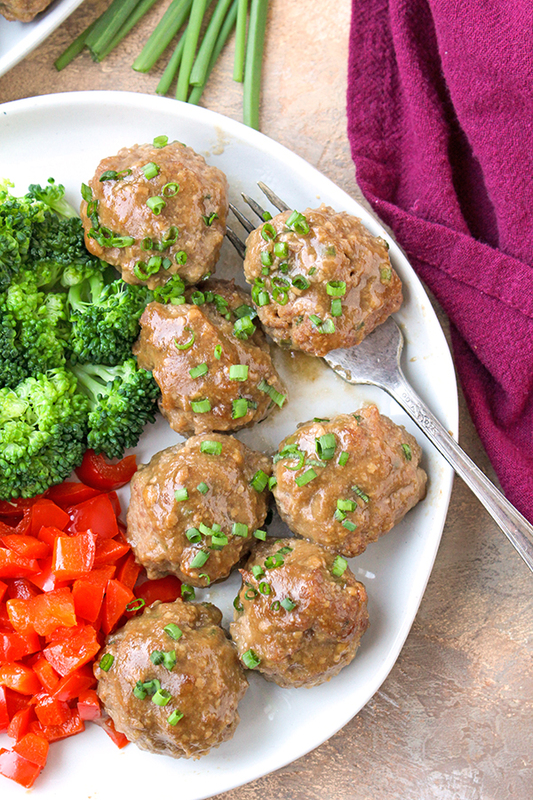 These meatballs will be loved by everyone, whether they’re doing a Whole30 or not. 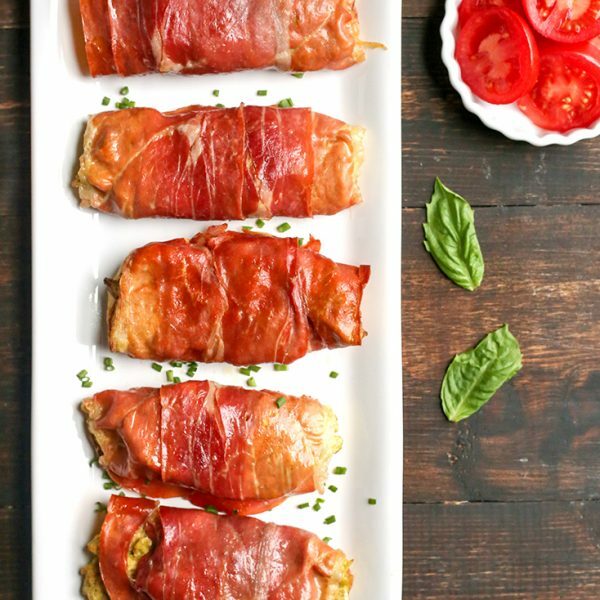 I’ve been eating them as a meal, but they would be a perfect appetizer for game day. 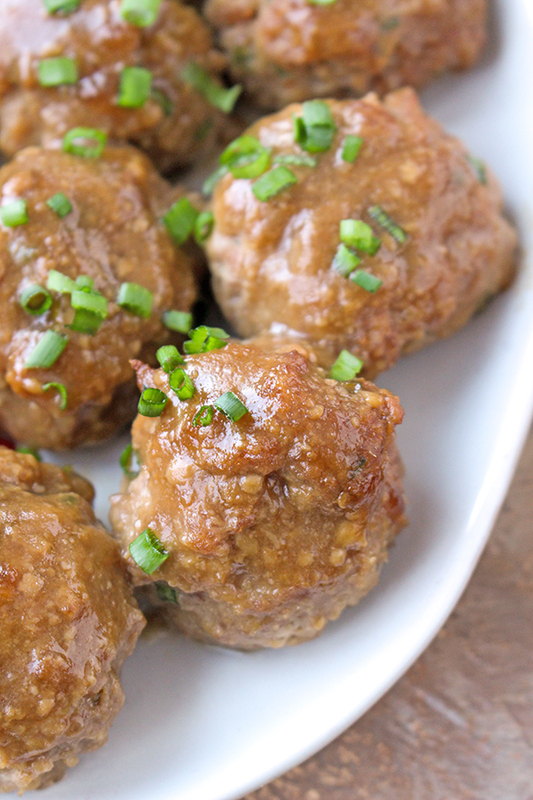 You will love these meatballs because they are juicy, tender, and so flavorful. So saucy and irresistible! 🙂 You can also make a double batch in a 13×9 if you want leftovers. 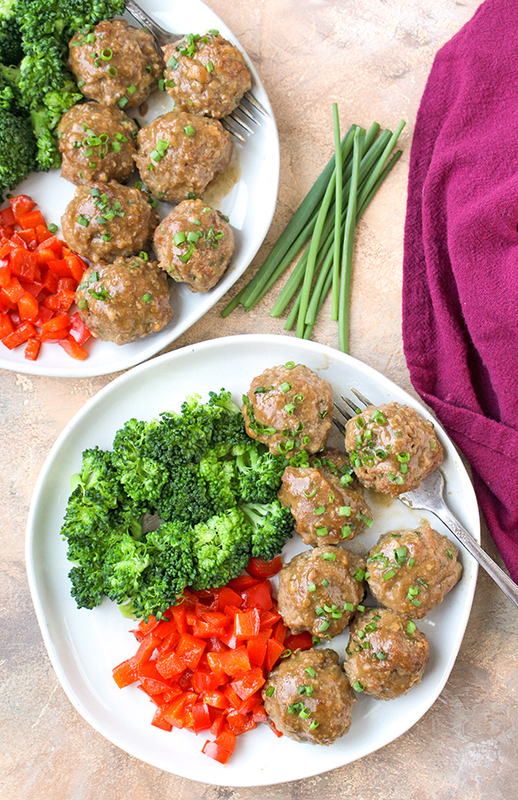 Here are more meatballs you will enjoy: Easy Whole30 Oven Baked Paleo Meatballs, Paleo Whole30 Chicken Zucchini Meatballs, and Paleo Whole30 Meatballs with Creamy Sauce. Preheat oven to 375° and get out a 9 inch square pan. Set aside. In a large bowl, combine turkey, egg, ginger, salt, garlic oil, coconut flour, and chives together. Mix until everything is completely combined and ingredients are well incorporated. Roll into 16 even sized balls and place them in the baking pan. They will fit tight and be touching. Now make the sauce. In a medium pan combine the orange juice, coconut aminos, water, ginger, and garlic oil. Turn to medium heat and stir together. 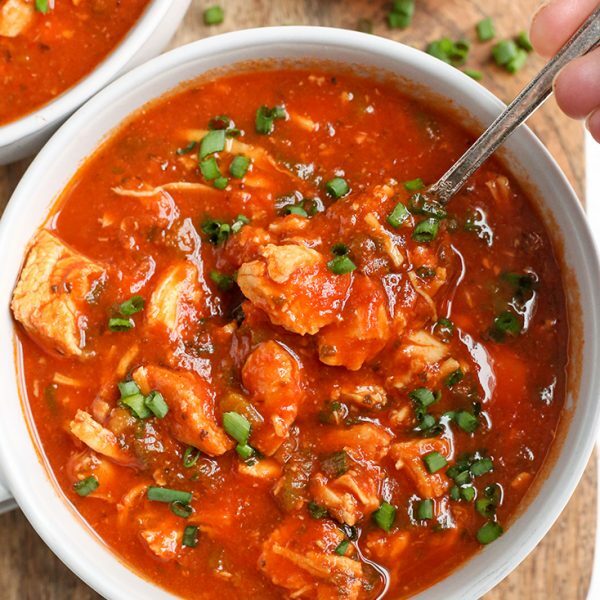 In a small bowl, combine cassava flour and enough water to make a slurry (about 1 tablespoon), stir mixture until smooth and add it to the saucepan. Stir until boiling and mixture thickens- about 3 minutes. Turn off heat and pour mixture over the meatballs. 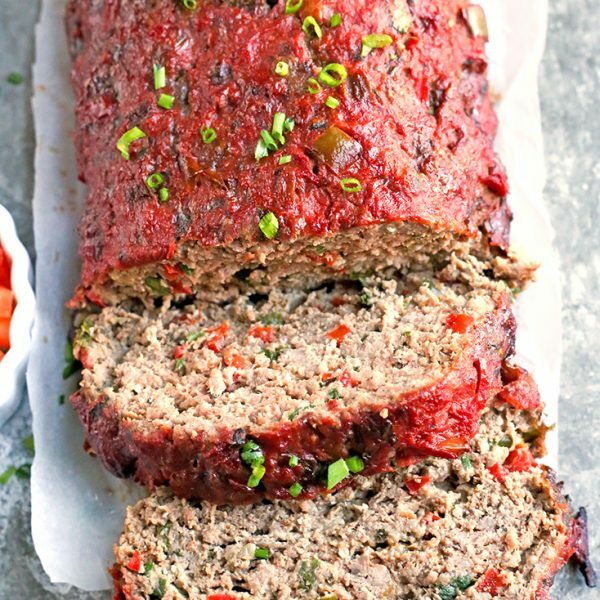 Bake for 23-25 minutes. 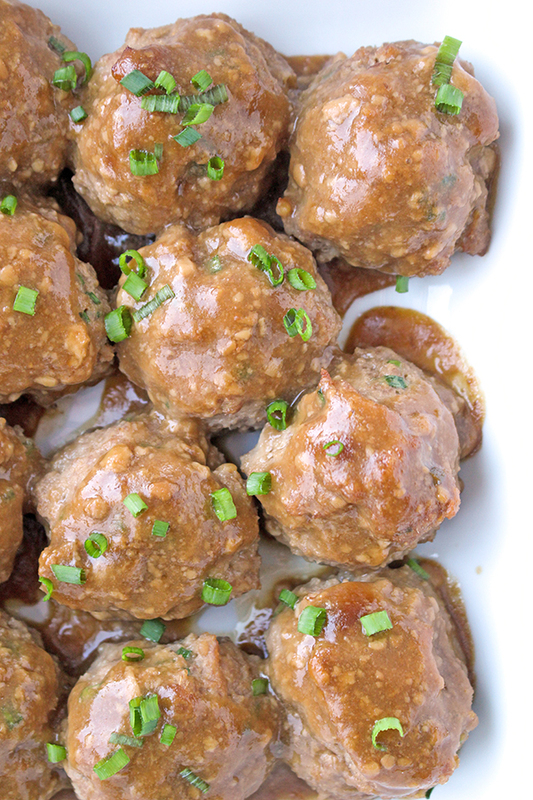 Spoon a little sauce over each meatball when serving. Are there any good replacements for the cassava flour? Hi Sam- you can use tapioca or arrowroot. Enjoy! Hi Jessica, Can I use Grass-fed Chopmeat? Hi Donna- are you talking about ground beef? Yes, you can use that. Enjoy!